BC Cross Country Championships hosted by our club in Clearbrook Park, Abbotsford on October 27th, 2018. Attracts hundreds of athletes from across B.C. for multiple races in a range of age categories. 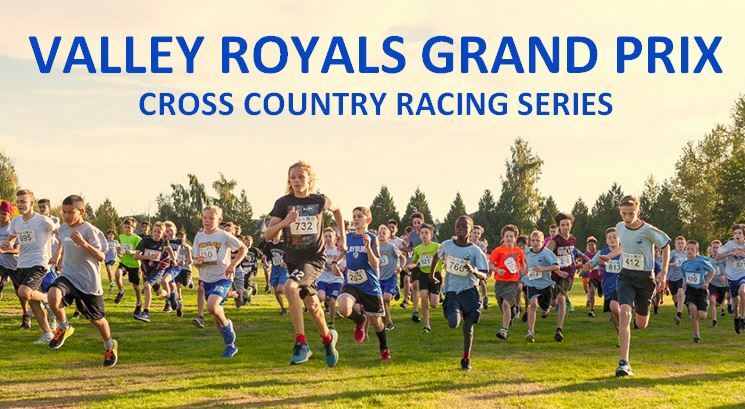 THE VALLEY ROYALS TRACK & FIELD CLUB WILL PAY RACE ENTRY FEE FOR FOR EACH CLUB ATHLETE/JD ATHLETE THAT COMPETES AT THIS PROVINCIAL LEVEL MEET See Lower Mainland Series info below or click on this item in our menu at the top of the page for more details about this event. The Lower Mainland JD & Midget Cross Country Series provides an opportunity for Junior Development and Midget athletes age 9-15 to compete in a number of cross country races throughout the fall/winter season. Use the Series to prepare for Championship races! The Junior Development & Midget Series consists of 6 races in September and October. The Youth/Junior/Open/Masters Series consists of 8 races. All races are sanctioned by BC Athletics. JD & Midget Runners will be scored on their 4 best performances. Any completed races count towards the series. Open & Masters athletes will be scored on the best of five (5) race results in the Series. You must complete a minimum of 5 races. Ties will be broken based on performances in the BC Cross Country Championship event. The points are assigned as follows: 1st = 30 points, 2nd = 27, 3rd = 25, 4th = 23, 5th = 21, 6th to 25th each place drops 1 point. Any ties will be decided by position in the BC Provincial Championship event. Runners must compete in the appropriate allocated race in order to score in their series. For example, if a junior runner elects to compete in a separate senior race then he/she cannot score in a separate age-appropriate event on the same day. 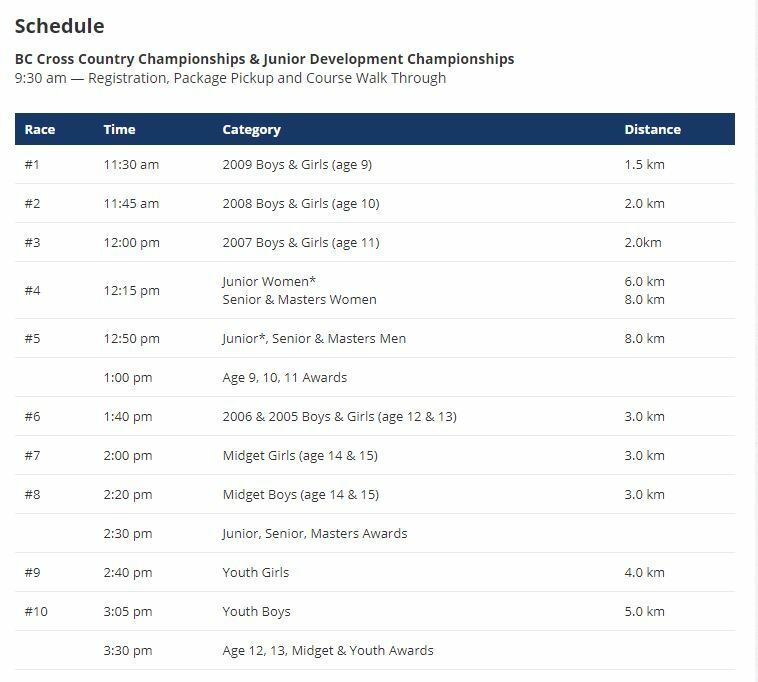 The series age categories for JD and Midget athletes are based on the year of birth: 2003, 2004, 2005, 2006, 2007, 2008 and 2009. Adult age categories for males and females are: Youth (16&17), Junior (18&19), two open age divisions (20-29 and 30-39) and four masters age divisions (40-49, 50-59, 60-69 and 70+). For the purpose of the series your age division is based on your age on December 3, 2018 for Masters and age on December 31, 2018 for Youth, Junior and Open age divisions. For the JD/Midget athletes in the Series: Plaques will be awarded to the top 3 boys and girls in each age group. For the Youth/Junior/Open/Masters in the Series: Prizes of gift certificates from area running stores will be awarded to the top three in each age division. If the number of participants warrants, awards may go 5 deep per age group. Score points for your club throughout the series. Each BCA member club’s 8 best individual points will be scored from each race, and accumulated to determine the winner of the Series Club Challenge Trophy. No minimum club size. 1. JDs and Endurance Running Group will be going to the: Pinetree Classic — Saturday September 15, 2018 JD/Midget/Open/Masters Mundy Park, Coquitlam. 10:00 am 6km Women / 8km Men Open/Masters. Undulating mulch/gravel trails, grass with some blacktop. Not suitable for spikes. 11:00 am – Noon. JD divisions. Course lengths vary from 2.5k to 4.4k according to age. Undulating mulch/gravel trails, grass, suitable for spikes. To register for this race email Christa at [email protected] before midnight Tuesday September 11th and let her know. She will complete your registration and apply any fundraising credits you may have toward the entry fee. First race 10:30 am JD/Midget/5km Women / 8km Men Open/Masters. To register for this race email Christa at [email protected] and let her know. She will complete your registration and apply any fundraising credits you may have toward the entry fee. 10:00 am Open/Masters men (8k) and women (6k). 11:45 am age 16-17 (women 4k, men 5k). Grass fields and bark mulch trails. 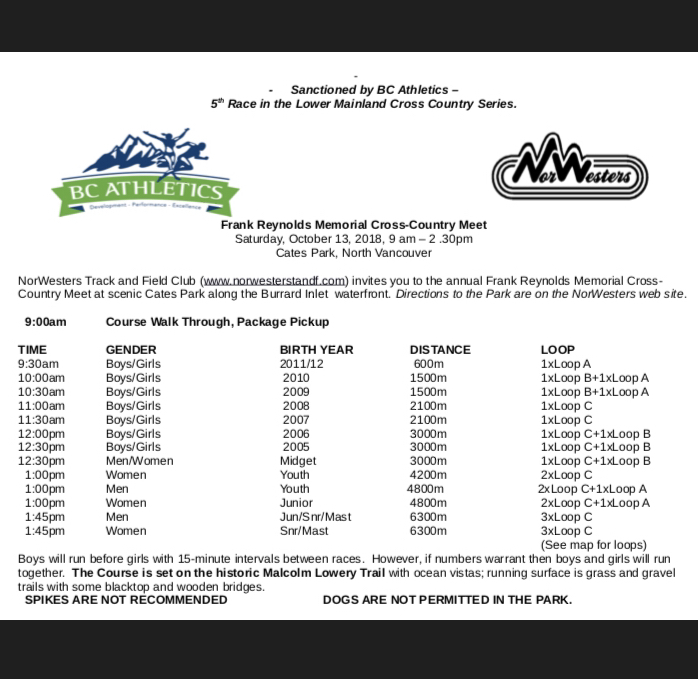 Same course as used for the Canadian Cross Country Championships. 10:45 am start age 12 and under (2k). 11:15 am start age 13-15 (3k). Grass fields and bark much trails. Same course as used for the Canadian Cross Country Championships. 10 am Track Rascals followed by JD ages 9-13, then HS ages 14-17. Grass & packed dirt trail. Starts in upper field off 132nd Avenue. To register for this race email Christa at [email protected] before midnight Tuesday September 23rd and let her know. She will complete your registration and apply any fundraising credits you may have toward the entry fee. THE VALLEY ROYALS WILL PAY THE ENTRY FEES FOR ALL CLUB ATHLETES WHO REPRESENT THE ROYALS AT THIS PROVINCIAL-LEVEL MEET. To register for this race email Christa at [email protected] before midnight Tuesday October 23rd and let her know what race you will run in. She will complete your registration and the club will pay your entry fee. 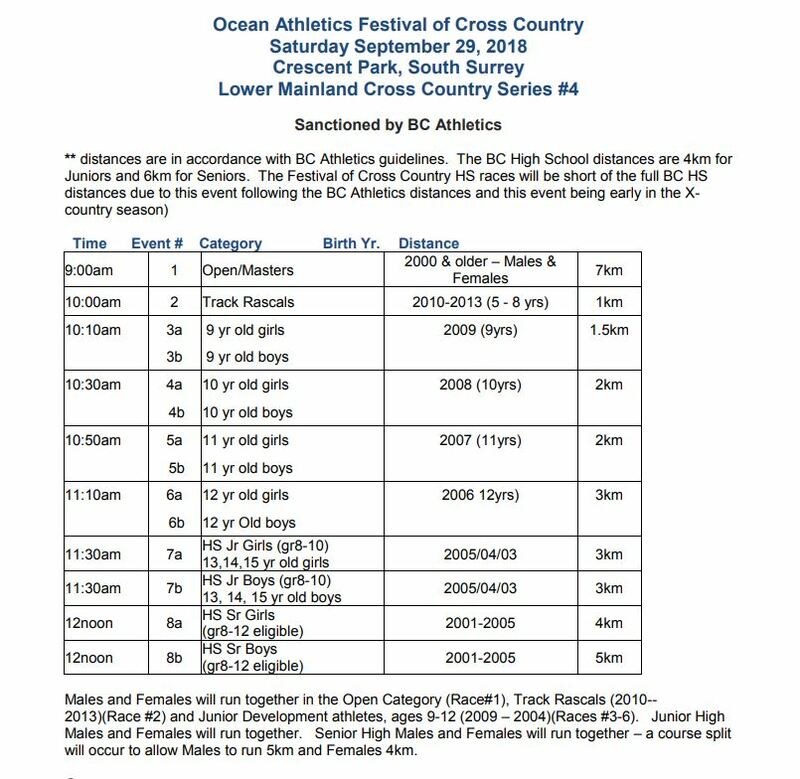 Note: * Youths may run up in the Junior event to qualify for the BC Team — must indicate race # when entering. 11:30 am First JD race 11:30 am, subsequent age divisions approx. 15 min intervals. Loops are on grass and trails. Spikes are suitable. 6.3k. 90% of course is on grass, 10% on crushed gravel, some rolling hills. JD/Midget Results for the Lower Mainland Series will already have been calculated at the conclusion of the BC Championships so this race will not count toward JD/Midget totals. Adult racers can count this race toward their Lower Mainland Series Results. 11:00 am A classic cross country course including sections of grass, trails, hills and sandy beach, with varying amounts of mud and water. 19 and under (5k), Open & Masters (10k). Post race hot showers, good food, and good company.